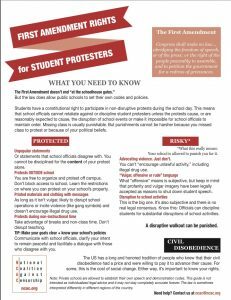 Do Student Protesters Have First Amendment Rights? Since the tragic school shooting at Marjorie Stoneman Douglas (MSD) High School on February 14th, the United States has seen an impetus in student activism in support of stricter gun control. 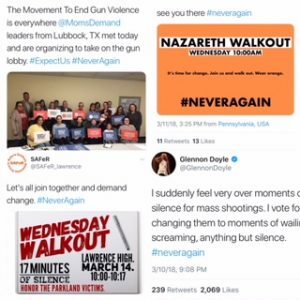 The Never Again Movement, created and led by student survivors like Cameron Kasky and Alfonso Calderon (among others), is gaining momentum, and not just with MSD students. #NeverAgain is popping up all over Twitter and other social media to demand change. Interviews are happening. Protests are scheduled. And amongst the hashtags and speeches, there are people saying that students are just kids, that they should not have the power to influence or make policy. They are saying that politics do not belong in schools; students are there to learn, not make political statements. A Houston-area school went so far as to threaten to discipline students who participated in any walkout or political protesting on campus. And it got me thinking. The First Amendment defends students’ rights to access and read a diverse array of books and printed materials in their school libraries. 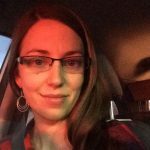 Are their spoken words protected by the First Amendment? Do these minors have a right to hear and express free speech when they’re in school? I decided to find out. So the short answer? Yes. Students do indeed have First Amendment rights to free speech even while on school property. But with a few caveats. The First Amendment states that Congress, a government entity, cannot infringe upon free speech or expression. Therefore, students attending public schools, which are funded by the government, clearly retain their rights to freedom of speech while on school property. These protections are not as clear when it comes to students attending private schools, which, generally, do not receive government funds. While these students are still citizens of the United States and, outside of school property, are afforded their rights under the First Amendment, the law becomes a bit murky while on school property. This is not to say that students attending private schools forgo their First Amendment rights entirely once they set foot on school property, only that these students are subject to a second set of rules and regulations that may override carte blanche freedom of speech. Many private schools include certain restrictions and limitations in their school contracts. Catholic schools, for instance, often include clauses that prohibit students from speech or action that is in contrast with the Church. If students or parents are opposed to this, they are obviously free to attend a different school. Regardless of whether the school is public or private, Tinker v. Des Moines includes the caveat that the school maintains the right to suppress speech or expression if it is “disruptive to a school’s ability to function.” The definition of “disruptive”, however, is subjective; it is left to the school to determine whether certain speech, such as a political protest, interferes with the day to day running of the school. Fortunately, restrictions are in place that prevent schools from abusing this power. According to the ACLU, “a school disagreeing with your position or thinking your speech is controversial or in ‘bad taste’ is not enough to qualify”. What is enough to qualify? Similar to the First Amendment placing exceptions on speech, such as obscenity, perjury, and blackmail, it also places exceptions on protected speech in schools. Schools retain the power to prohibit speech that is vulgar, profane, or incites illegal activity, such as drug use. An example of this occurred in the 2007 case Frederick v. Morse where a student sued his principal for suspending him for 10 days after he held up a sign that said Bong Hits 4 Jesus at a school function. In a 5-4 decision, the Supreme Court upheld the legality of the punishment, stating that “school officials can prohibit students from displaying messages that promote illegal drug use”. Keep it peaceful and non-violent. No vulgar, profane, lewd, or illegal speech (written or spoken). Do not disrupt school activities. Plan protests around instructional time. Communicate with school officials. Make them aware of the position of the protest and its intent to stay peaceful. Even if these guidelines are followed, schools do still retain the right to discipline students, but, according to the National Coalition Against Censorship (NCAC), they are confined to the same consequences as an unexcused absence or leaving school without authorization. Basically, schools are not allowed to dole out stricter punishments merely because the absence is related to a political statement. Students should be aware of their school’s policy regarding unexcused absences and be prepared to face those consequences if they choose to participate in the walkouts. The purpose of education is to help prepare students for success outside of school. We want students to become informed, considerate, and engaged citizens, and we achieve this by encouraging and promoting intellectual freedom, through both written and spoken words. In another case regarding the First Amendment and minors, American Amusement Machine Association v. Kendrick determined that, “People are unlikely to become well-functioning, independent-minded adults and responsible citizens if they are raised in an intellectual bubble.” Students can learn and benefit from free speech in civil protests, either by participating or observing those involved. And they have the ability to affect real change through these actions, if we choose to let them.